Forsyth report - IOS monitoring of progress?? 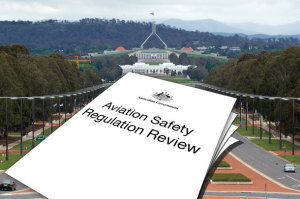 Quote: Senator FAWCETT: Mr Mrdak and Mr Carmody, speaking of hopeful, this committee was very hopeful after our inquiry into aviation safety reporting and the subsequent Forsyth review. I have seen some substantive changes. It has been a long and involved process of planning and changing of key people in the organisation. Where are we at with the Forsyth review implementation? Can you give us any assurance that the views of industry that the Forsyth review essentially has an RIP after its name are false and that there are significant changes occurring? Mr Carmody : Of the recommendations of the Forsyth review, a lot of them have already been completed. I met with Mr Forsyth, in fact, two weeks ago. We sat down and went through the recommendations to see whether or not there were any areas of disagreement and there are a few. I undertook to provide him some information to show where in fact things had changed. I.. Senator FAWCETT: Are you in a position to expand on that? Mr Carmody : As a result of some of the recommendations, we have updated our surveillance manual, for example, and we have instituted new procedures to be put in place when we undertake surveillance. The manual is in place, people have been told what to do and if they do not do it, we will do something about it. His view was initially that we should wait for a number of years to see whether or not this culture has actually changed. I said I did not think you could actually do that. We have made the procedural changes to allow this to happen and we are following up. Those are the types of discussions we had as we were working away through things like our view on just culture. We have made great inroads in the just culture space. As I said to Mr Forsyth though, if I make an adverse regulatory decision on somebody, the first thing they will say is 'You are out to get me,' or 'It is the culture of the organisation; it is not what I was doing wrong.' I said we really have to understand that it is a complex industry and a complex environment. We are hoping to have the majority of work done about the middle of this year but I still have half a dozen recommendations or so that will not be done—things like all of the applications being delivered online. It is going to take me a number of years to invest in the technology and infrastructure to actually accept all applications online; having all the regulatory development completed by 30 June is not going to happen. I am working on a program to do it. The program at the moment is a number of years, and I am trying to reduce it. I have gone through all of those with Mr Forsyth. We try and work our way through what is achievable by the middle of the year and we are still in a dialogue. But let me assure you, the work is underway and a lot of progress has been made. Senator FAWCETT: Could I ask you on notice to give the committee a list of recommendations that you believe have been implemented, recommendations that are still open and the actions that you either plan to take or that you have decided, for whatever reason, not to implement. Mr Carmody : Certainly. As I indicated, we are doing that work now anyway, so by the time the notice period comes through we should have worked through a number of those things with Mr Forsyth. I am hopeful that Mr Forsyth, as the author of the review, and I, as the regulator that is implementing those things, will be agreeing on each one of the recommendations that have been closed out and the ones that remain. That is my aim. So I would be delighted to provide that information. Of course, a number of the recommendations are also departmental and we have been managing the actual list of recommendations through the department. I have worked very closely with the department to conclude that list. The Aviation Safety Regulation Review report, also called the Forsyth Report, was critical of CASA's relationship with the aviation industry. CASA Acting CEO and Director of Aviation Safety Shane Carmody and David Forsyth, author of the Aviation Safety Regulation Review (ASRR) have met to discuss progress in implementing the review's recommendations. According to information Carmody supplied to Senate Estimates last Tuesday, the two met a fortnight ago. "We sat down and went through the recommendations to see whether or not there were any areas of disagreement and there are a few. I undertook to provide him some information to show where in fact things had changed," Carmody said in response to a question from Senator David Fawcett. "We have made great inroads in the just culture space. As I said to Mr Forsyth, though, if I make an adverse regulatory decision on somebody, the first thing they will say is 'You are out to get me,' or 'It is the culture of the organisation; it is not what I was doing wrong.' I said we really have to understand that it is a complex industry and a complex environment. We are hoping to have the majority of work done about the middle of this year but I still have half a dozen recommendations or so that will not be done." Carmody admitted that CASA would not make the 30 June deadline for all recommendations to be implemented, noting that the current schedule was over "a number of years", but that he and the CASA team were trying to reduce that. "I have gone through all of those with Mr Forsyth," Carmody told the senate committee. "We try and work our way through what is achievable by the middle of the year and we are still in a dialogue. But let me assure you, the work is underway and a lot of progress has been made." David Forsyth was positive in his evaluation of the meeting, despite the differences of opinion on some matters. "He [Carmody] and I are trying to reach agreement about status, and as Shane noted, we had some areas of disagreement," Forsyth told Australian Flying. "He is going to provide me with some additional information, and I am going to seek more feedback from some industry players as to their view of progress. "There has been progress on some items, some push back on others, and there are recommendations which will continue to be work in progress. "The positive aspect is that Shane is discussing the issues, which is the first meaningful dialogue I have had with anyone in CASA since the report was written. It is a pity for industry that two years were lost until Shane came on board and picked up the ball." Carmody's evidence to the senate was that CASA was working towards the day that both he and Forsyth were to agree on the implemented recommendations. "I am hopeful that Mr Forsyth, as the author of the review, and I, as the regulator that is implementing those things, will be agreeing on each one of the recommendations that have been closed out and the ones that remain. That is my aim." 6D AGAD discretely shelfwares ASRR report - WTD? However while I'm still able to click a mouse or punch a keyboard, I am, determined to keep the useless, NFI, walking & talking, aviation disaster of a minister honest, by reflecting on the many excellent contributions to the original Forsyth review. Therefore in the interests of keeping the pot simmering I intend to extract and focus on some of the quality but lesser profile public submissions, which (at this stage) are still able to be accessed on the Department's website - see HERE. Quote: "...I have made this submission because, with all due respect to the Director and his staff, I strongly suspect that several basic principles of achieving safety in aviation have gone missing in action. CASA appears to be entrenching policies that were forced upon the “captured” CAA in times of financial stringency, and yet corporate management appears to be gold plated. ATSB continues to be ineffective and administrative separation of ATSB from CASA, and CASA from the AGPS, are taken for granted. Is CASA to become little more than a client of the European Airworthiness Authority, the FAA or, manufacturers, and incapable of independent thought and action..."
Next and in anticipation of the PelAir final report public release in two days time, I would like to draw attention to the BOM submission: 256 Bureau of Meteorology (BoM)PDF: 497 KB. The Bureau suggests considering including specific regulation regarding aviation meteorological services within the Civil Aviation Safety Regulations 1998 (CASR). • clarify the standards required within the Australian airspace. A more detailed aviation meteorological regulation, as per the New Zealand Civil Aviation Rules Part 174 – Aviation Meteorological Service Organisations – Certification, would more clearly define the requirements for aviation meteorological services in Australia. • improved understanding of the meteorological standards required within the Australian airspace. The MAO has developed documentation based on the NZ CAR Part 174 which is currently used as part of the process for the Director of Meteorology to authorise aviation meteorological observations providers under Civil Aviation Regulations 1988, regulation 120 (CAR120). This could form the basis of an initial draft for a new meteorological regulation within Civil Aviation Safety Regulations 1998.